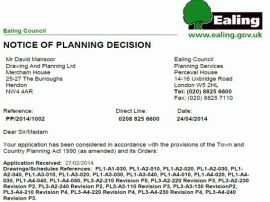 The Drawing and Planning team of Architects, Structural Engineers, Town Planners and Consultants are here to make the planning process straightforward and stress free, helping you successfully achieve planning application first time with Ealing Council! 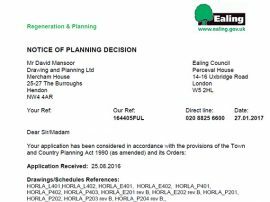 We take pride in our Success Rate with Planning Permission Applications in Ealing Council! 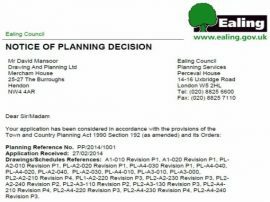 Our experienced consultants will remain in contact with the Planning Department at Ealing Council at every stage of your planning application. Whether you are applying for a Rear Extension, Side Extension, kitchen extension or conversion, Loft Conversion, Loft Extension, domestic usage, Change Of Usage to residential dwelling, new build development of flats in Ealing Council, We can help you gain planning permission by giving you the Advice, Support and Documentation you need at each step of the way. The planning process can be complicated, Drawing and Planning's consultants, Architects and entire team are here to make the planning application process Simple For You! Our unique and successful approach of offering an all-in-one planning packages allows you to make significant savings over traditional architect’s fees! 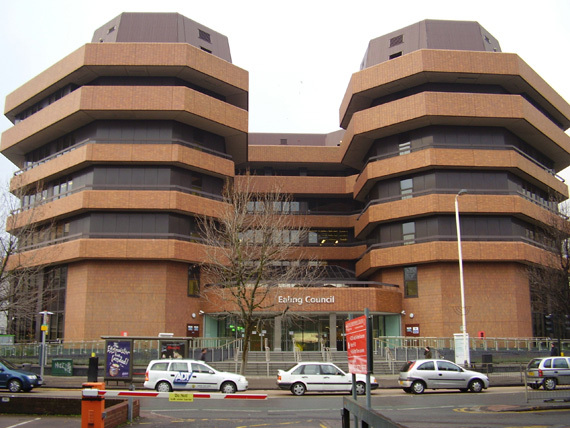 With an in-house team of Architects, Structural Engineers, Town Planners and Consultants working together through every aspect of your application, we are best placed to handle your application and help you get Planning Permission with Ealing Council! 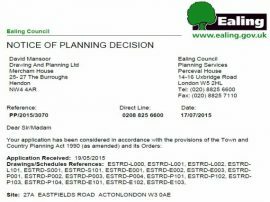 Our consultants are qualified Town Planners with expert, up to date knowledge of the latest Planning Legislation applicable in Ealing Council. They work alongside our architectural design team at all times to ensure that the planning drawings are not only accurate and to scale but also in line with the complex Planning Regulation demands of Ealing Council. Last year, we successfully submitted 500+ planning applications across London. 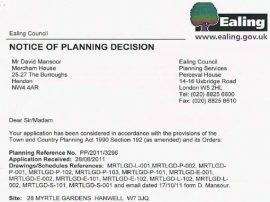 We know what it takes to successfully attain Planning Permission first time with Ealing Council. 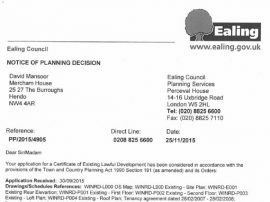 We will be in constant contact with them at every stage of your project to ensure that your application is in line with the regulations, helping you gain planning permission with Ealing Council! Scaled Architectural Drawings are just one aspect of a successful planning application. Drawing and Planning do not simply create Planning Drawings. 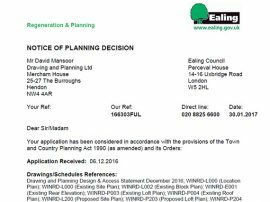 Our consultants are well acquainted with the current Planning legislation in Ealing Council and work closely with our architects to ensure the drawings are in line with current regulations. At a time where the principles of the planning regime are in a state of disarray, our clients benefit from the assurance that their application is being handled by the experts! The drawings to accompany your application. You can enlist the services of a traditional Architect to create drawings for you. However most traditional Architects are just that, without in-depth knowledge of the planning system. Many of our clients come to appeal their application after the proposals from their architect were refused on the basis of a basic planning principle. Value for money. Our Planning Drawings are considerably cheaper than conventional Architects as they do not require the same degree of detail as traditional Drawings. This allows us offer you a complete Planning Package for a fraction of the price of an Architects Drawings. Once planning permission has been approved, we can easily manipulate the drawings to be used by a builder. This approach has saved our clients significant amounts of money which they then put towards the building costs. Not a one man band Service. You may consider buying very cheap drawings from a one man band planning service from your local classifieds but can you be sure there proposals will meet all the current planning regulations? We are constantly reviewing planning legislation and incorporate our extensive knowledge and expertise into every single application to ensure it is accurate and in line with all planning regulations. We know Planning! 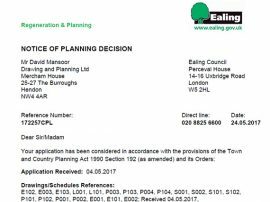 We know what is likely to be granted in Redbridge and only propose development we believe will successfully attain Planning Permission. 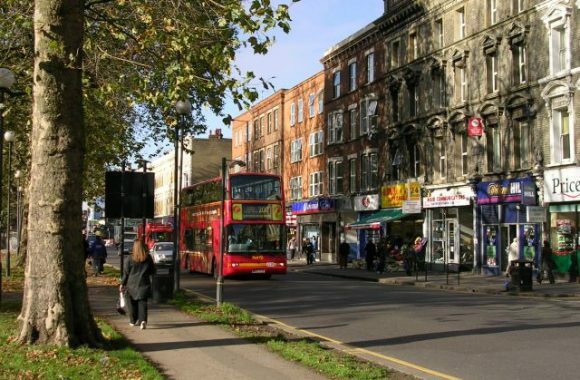 We are also in constant contact with the Duty Planning officers at Redbridge Council and will liaise with throughout your application process to maximise your property and your prospects of successfully attaining planning permission. Drawing and Planning have a wealth of experience and expertise in planning ever since pioneering the association of Architects, Structural Engineers, Town Planners and Consultants under one roof. We continue to lead the way by offering our clients a comprehensive solution to their planning dilemmas, making the process simple and straightforward. A number of businesses struggle when it comes to planning applications, simply because it is out of their skills range. Any business will specialise in one skill in particular, and so there is no shame in looking for help. There are many benefits to looking into a planning consultancy Ealing company, simply because it will speed up the process a huge amount. 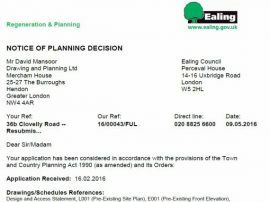 Although you may not think this is necessarily important, being able to make the planning application Ealing go faster will benefit you in a number of ways. Not only will it save you money overall, but it saves frustration and a lot of time on your part. 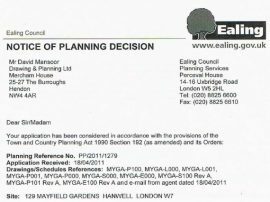 This makes a planning consultancy Ealing company such as ours an incredibly good investment, simply because the planning application Ealing will go a lot faster in the long run, helping you along the way, so that you can really focus on your business and dealing with customers, so that whatever development or extension you are looking into can go on with the minimum amount of fuss, so that overall it becomes far easier for you and your company, without sacrificing any needs of your customers in any way whatsoever, making it really worth your while.